On September 24, a presentation event organized by “Koghb” Foundation for Development of Education, Culture and Sport took place in the Special Events Auditorium of Gafesjian Center for the Arts, announcing the kick-off of “Koghb-Tumo” project. During this event a memorandum of understanding was signed between “Koghb” Foundation, Tavush regional administration, Ucom and charitable organization “Mission Childhood”. During the event, Artur Abovyan, the Director of “Koghb” Foundation, and Marie Lou Papazian, the Director of Tumo Center for Creative Technologies, presented the details of “Tumo-Koghb” project. 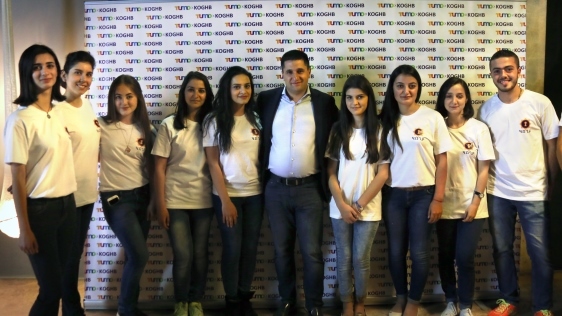 According to the speakers, a new “Tumo” center for at least 600 students will be opened in Koghb community of Tavush region, which will also serve the teenagers and young people from Noyemberyan, Berdavan and other border communities. The construction of the center will start in November, and the educational activity of the center will commence in 2018. The educational program will be the same as those implemented in Tumo centers of Yerevan, Dilijan, Gyumri and Stepanakert, and the teaching staff and international experts will continue to share their knowledge and experience in the new center as well. “In recent years Ucom has been consistently implementing comprehensive educational projects for school-age children. Being very well aware that not all settlements have equal access to educational opportunities, we especially focus on settlements with limited access to high technologies. As an Armenian operator, today Ucom directs all its efforts towards the development of our motherland, the Armenian people and, in particular, the young generation”, - said Hayk Yesayan, the CEO at Ucom. Arman Barseghyan, the Chairman of the Board of Trustees of “Koghb” Foundation summed up: “A few days ago we celebrated the 25th anniversary of independence of the Republic of Armenia. This initiative is one more step forward in strengthening the independence of our state”.